Producers and landowners in most of Kansas will soon have the opportunity to enter into the marketplace for carbon credits. A series of local educational meetings has been scheduled in February in a dozen counties to discuss a voluntary pilot program for carbon credits on land either under conservation tillage or that has been established in grass on or after Jan. 1, 1999. The meetings are sponsored by the Kansas Coalition for Carbon Management, an organization consisting of K-State Research and Extension, Kansas Resource Conservation and Development Councils (RC&Ds), many Kansas commodity organizations, Kansas Farm Bureau, and many state and federal agricultural agencies. The pilot project is being offered by the Chicago Climate Exchange (CCX), a voluntary, multi-sector market for reducing and trading greenhouse gas emissions. The program is being administered by the Iowa Farm Bureau, serving as the “aggregator” -- an entity that acts as a middleman between the CCX and producers/landowners. An aggregator pools many separate parcels of qualified acreage into one large block for purposes of carbon credit trading on the CCX. RC&D personnel will then explain the pilot program being offered by CCX and administered by the Iowa Farm Bureau. In this program, producers or landowners can make an application to contract with the Iowa Farm Bureau to sell carbon credits for them on the CCX exchange. The acreage eligible for this program includes conservation tillage (no-till, strip-till, and ridge-till) and grass plantings made on or after Jan. 1, 1999 (mostly CRP, CSP, or conservation buffer strip plantings) in the eastern half of Kansas. 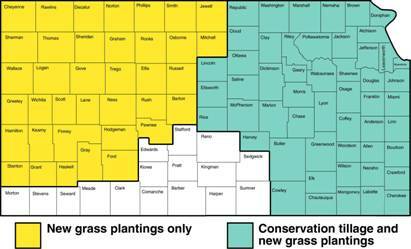 In the western half of Kansas, only recent grass plantings are eligible. The map below shows how the state is divided for purposes of this project. There are some requirements made of those who sign these contracts, which will be explained by RC&D representatives at the meetings. Payments for carbon credits are not established in the contract, said David Miller, Iowa Farm Bureau director of commodity services. The payment will depend on the price on the CCX board at the time the credits are sold by Miller. Payments have been averaging anywhere from $0.50 to $1.00 per acre per year, but this fluctuates. A maximum of about 150,000 acres can still be contracted in this pilot project between now and April, 2005. More than 80,000 acres are already under contract in Iowa. February 16, 10:30 a.m. Chanute. Alliance Room, Memorial Auditorium, 101 S. Lincoln. 620-431-6180. February 16, 10 a.m. Manhattan. Pottorf Hall, Kimball & Avery St. 620-273-6321. February 17, 10 a.m. El Dorado. Butler County Community Building, 200 N. Griffith. 620-273-6321. February 17, 1:30 p.m. Emporia. Lyon County Extension Conference Room, 618 Commercial St. 620-273-6321. February 22, 1:30 p.m. Hays. Kansas Highway Patrol Meeting Room, 1821 Frontier Rd. 785-425-6647. February 22, 1:30 p.m. Marysville. City Hall, 209 N. 8th. 785-945-6292. February 22, 7 p.m. Colby. Thomas County Office Complex Conference Room, 350 S. Range. 785-462-2602. February 22, 7 p.m. Hiawatha. Fisher Center, 201 E. Iowa. 785-945-6292. February 23, 1:30 p.m. Garden City. K-State Research & Extension Center, 4500 E. Mary St. 620-355-4091. February 23, 1:30 p.m. Valley Falls. Delaware Township Hall, Broadway & Walnut. 785-945-6292. February 24, 11 a.m. Ottawa. Franklin County Annex Meeting Room, 1418 S. Main. 785-242-2073. February 28, 7 p.m. Concordia. Cloud Co. Community College, 2221 Campus Dr. 785-392-3393. One of the newest trends among agricultural and environmental interests is carbon management on agricultural land. Find out what this is all about, and the many benefits carbon management has to offer producers and the general public, at a public forum to be held on Friday, Feb. 11 at Kansas State University’s Alumni Center, from 9 a.m. until about 1 p.m. The forum is free and open to the public. Speakers will explain carbon sequestration, and discuss its many benefits, economic advantages, and government programs and policies that can help promote it. The principal goal of carbon sequestration is to help reduce CO2 levels in the atmosphere. This is part of the general strategy of agricultural soil mitigation of greenhouse gases, a powerful environmental benefit now being recognized worldwide. 9:00-9:20: Carbon Management of Agricultural Lands. John Kimble, USDA-NRCS or Ron Follett USDA-ARS. 9:20-9:40: Kansas Practices that Conserve Soil Carbon. Scott Staggenborg, K-State. 9:40-9:55: Soil Quality. Chuck Rice, K-State. 9:55-10:10: Soil Erosion. Rattan Lal, Ohio State University. 10:35-1050: Water Quality. Gary Pierzynski, K-State. 10:50-11:05: Water Retention. Andy Manale, EPA. 11:15-11:35: Economics of Carbon Management. Sian Mooney, Univ. of Wyoming. 11:35-11:55: Government Programs and Policy. Debbie Reed, NETL. 11:55-12:10: Potential Carbon Markets in Kansas. KCCM.